Generally, Workstations or cubicles are created in offices using movable partitions. Partitions are a convenient cost effective way to divide up an open office space into more usable workstations. A well designed Cubicle set up can transform a spartan open space into premium office space. You will not have to provide single desks and tables and instead all office equipment can fit into a single cubicle area or workstations. Workstations and Cubicles have numerous advantages over the traditional office space. If you are setting up an office, partitions and cubicles are an excellent option to consider if you have some open space or if you are going to put several workers in one room. Workers like to have their own space. It has been shown that many employees are more productive if they have some privacy and an area that is dedicated to them. And since it’s not always possible to provide each employee with an individual office, workstations created with high quality panel systems are the next best thing and in many cases, even better. Usually, separate workstations are built for senior employees but that does not necessarily mean that junior employees have to be restricted from having their own private workspace. You can create office workstations by providing cubicles to your employees at an huge discount if you purchase from Office Furniture Unlimited. Our workstations will compliment the look of any office. Beautiful wood finishes and desk drawers that are elegant and functional will allow your workers to stay organized and have a eye-pleasing workspace. Today’s workstations are made to last and we maintain an excellent inventory or used panel systems and can get new panel system delivered and set up at your office in short order. All of our panel systems are made with durability as a top requirement. You can rely on our specialized office cubicles to look good for years to come. Our great variety of office chairs will be an ideal combination with the panel systems to completely furnish your office. We also offer branded cubicles and hence you will not be objected in choosing the ones of your trusted and preferred brand. If you visit our office furniture stores in Greensboro, you will be exposed to the best variety of cubicles, which are a blend of artistic uniqueness and modern trends. 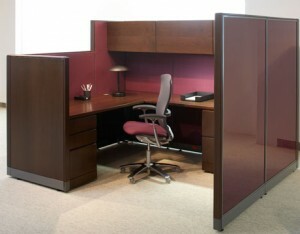 Similar varieties of cubicles are available in our other furniture stores in Winston-Salem, High Point and other areas. Other than our office cubicles for sale, we also offer office chairs, desks and other furniture for official purposes. You can also find used office furniture in our furniture stores; though used they usher a new-made look and are assured with a warrantee over certain period. The discount office furniture that we provide will satisfy all your grievances of having the dull looking furniture in your office, when you could not afford the trendy ones, which were of hiked prices. We leave no spaces for consumer dissatisfaction with our products.